Here's a few things that I have been loving in the month of June. For my first favorite of the month is this Pretty as a Peach Foaming Sugar Scrub. I picked this up from Bath & Body Works the end of May while I was hanging out with Imelda. I remember she had mentioned liking their body scrubs and I had never seen or heard of them. Once I seen that they had one in peach scent I picked it up to give it a try. I fell it love with this scrub after the first use. The scrubs weren't too harsh on my skin it was just perfect and the peach scent was perfect. My body felt very soft after I used this and I have been using it every few days a week the entire month of June. I ended up picking up a few more of these scrubs during their Semi Annual Sale which Ive already shared my haul on here last week. The day I left for L.A. I had asked Rudy to stop at Morphe Brushes because they had the Jeffree Star Cosmetics Skin Frost in stock and I needed to get my hands on Peach Goddess. Since the first photos of this highlighter was released I fell in love with this shade and peach goddess it was perfect for me. From the day I purchased peach goddess this has been the only highlighter I've been using. It is so gorgeous and different from any highlighter I own. I think its just perfect especially for spring and summer time. Nothing compares to it and I really wished I picked up a back up of this just in case haha. I really like how huge the pan is, its bigger than my palm. Since I've been loving this shade out I've been debating on purchasing Ice Cold next. These highlighters are definitely worth the price, at least peach goddess is. While at Morphe Brushes I ended up picking up one makeup brush. I already own the M527 which I talked about in a past monthly favorite and it is still a favorite of mine. However I wanted a brush similar to that one just a little bit smaller in size so I picked up the M523. I've been really liking to use goat haired brushes for my bronzer and contour and this M523 is perfect for doing both of those. This brush allows me to bronze my face without getting a little too crazy or going overboard, it keeps my bronzer more clean. It is tapered on the very top of the brush which is perfect to contour as well. I have been using this brush most of the days that I apply makeup because it keeps everything very precise without me having to go back and clean anything if I'm in a hurry. I love Morphe brushes they have most of my favorite brushes and it's all so affordable. As you guys may know I love Lush Cosmetics and I am always looking for something new to try out of theirs. Just any excuse to go into their store and browse around really. One night I was watching a video on Youtube and one was a Lush haul. 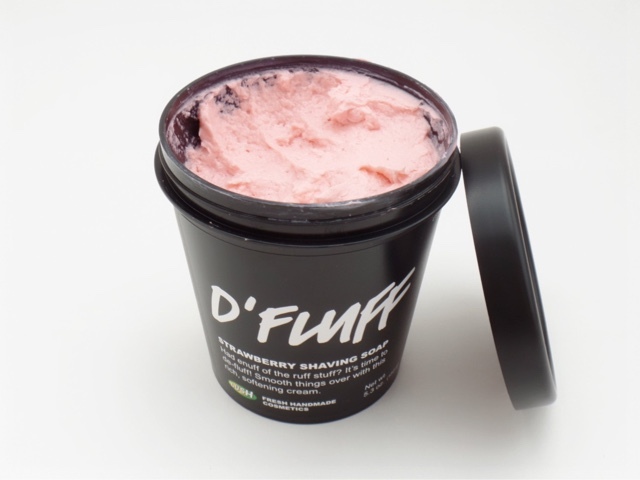 One of the items the girl mentioned was D'Fluff which is a shaving soap. Since warmer days are up ahead my legs always get so sensitive because I am shaving a couple times a week. My leg gets filled with red bumps and sometimes it is pretty painful. I went to Lush.com to read a little on this shaving soap and sounded wonderful. This is a strawberry shaving soap that is filled with tons of different oils to help moisturize and smooth your legs. It is also supposed to help minimize the after shave redness. While Imelda and I were shopping around one day I decided I wanted to pick this up to see if it would help my legs out. D'Fluff is magic! This is exactly what I've needed my whole life. After just one use my legs was extremely soft and it wasn't in pain at all since I saved about five days prior. I've used this on my arms as well and my arms feel just as great. I can't believe how soft this leaves my skin I am going to re-purchase this forever. After I shave I have been applying their Charity Pot body lotion which the girl that was helping was nice enough to give me a generous sample of and I love it. This two things together is the best combo my skin is ridiculously soft, softer than a baby's bottom too. Once I am out of my sample I am going to purchase a full sized pot! This next favorite should come as no surprise since I made a entire post dedicated to it. The Younique foundation has been the only foundation I have been reaching for this entire month. Like I said I made a whole post dedicated to this foundation so I don't want to spend too much time on it. If you would like to read my review just click here. This foundation does it all for me and more. It has great coverage, can be used as a light coverage foundation but can definitely be a full coverage, very build able without making you look like you caked on the foundation, makes my skin look flawless, gives me a glow and more! I am extremely happy that I finally purchased this foundation because I am in love. I want the highlighter! Still haven't made my mind up if I want that one or the Glow Kit. I've been holding back from making my decision. I should of pick up the D'Fluff, I have the same issue. 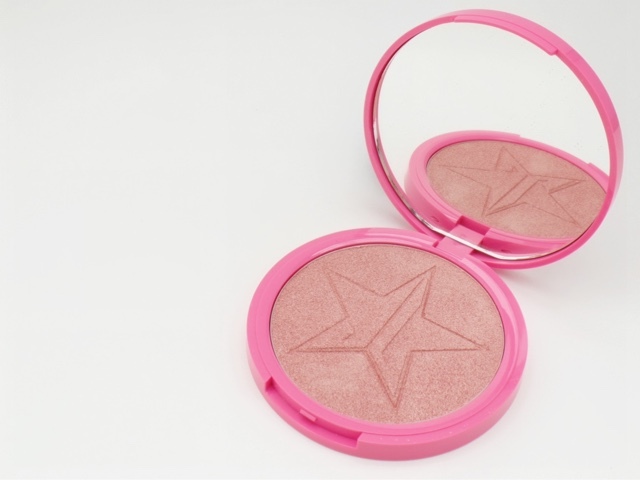 I love the highlighter it's so pretty and the pan is huge. I don't think I'll ever run out of it. I'm pretty sure you'd love D'fluff then especially since you liked Charity Pot.